WELCOME to SUPPORT Letters, the official newsletter of the Newfoundland and Labrador SUpport for People and Patient-Oriented Research and Trials Unit (NL SUPPORT), where we bring you the latest updates on what we're doing to encourage the growth patient-oriented research in the province, updates on training programs and funding opportunities, success stories from the research we're already doing, and more! WHEN WE LAUNCHED back in November of 2014, nlsupport.ca was designed as a way for us to communicate our vision for what NL SUPPORT would become: new infrastructure, new methods, new faces to support a new way of doing research. In the nearly two years since then, we've grown a lot: grown our staff, refined our vision, expanded the services we can offer. 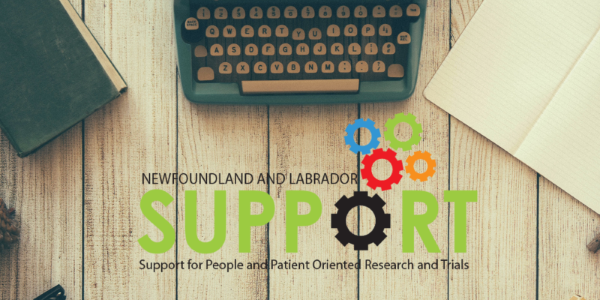 In short, we've outgrown nlsupport.ca as it currently exists, and hope to relaunch the site later this year as a portal to patient oriented research for students, academics and patients alike. But before we start pulling the place down to the studs, we need your input! We need to know what you'd like to see in the new and improved nlsupport.ca. So, click the link, come on by, and have a look around our current site and let us know what you'd like to see changed! You can send your comments, thoughts and impressions along to Dale Humphries (dale.humphries@med.mun.ca). A word of thanks to all of our contributors for their hard work putting together this edition of SUPPORT Letters, including Eva Vat, Melissa Power and Dr. Krista Mahoney, and thanks to you for subscribing and reading!